...yep....ANOTHER puppy birthday card. :) This time I used my Penny Black "Hello Friend" and "Bubbly" clear sets. The cloud is up on foam tape and diamond glaze was added to the headlights and windshield. I'm sending this one off to another male family member....hope it works okay as a masculine card. haha....adorable!!! Love that sentiment!! GREAT colour blocking too!!! Adorable Denise! I think it is just perfect for a masculine card! Love the teal and the orange! So adorable!! Love the DP layers. Great design. Perfect for a masculine card. Sending you hugs for the weekend! Adorable, I'm sure the recipient is going to appreciate it. Another darling dog card. I think it makes a perfect masculine card. It even has a little humor in it. Love it. You know I love dogs, so of course I think this b-day card is just the cutest, Denise! 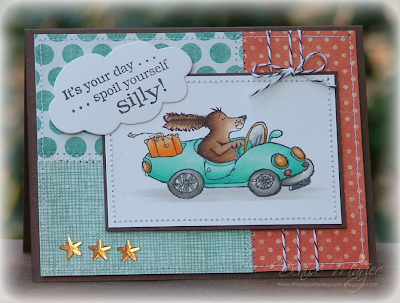 What a wonderful layout...especially putting your sentiment on a cloud die cut...now why haven't I thought to do that! You make the best Penny Black cards!!! Such a cute card! I love the stitched panels and the glaze! This is so cute, great layout and colors. Oh how I love that image! What a fun card!